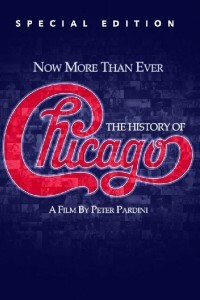 Now More Than Ever: The History of Chicago is the unbelievable true story of the rock band Chicago. Spanning 50 years, from 1967 to the present day, it highlights a band that has sold over 100 million records and has never taken a year off of touring, still playing well over 100 shows a year. Detailed are several stories behind their hits and a look at the way they dealt with both ups and downs on their way to becoming the highest-selling band of the 1970s and the second highest selling American band of all time. Featuring interviews from band members both past and present, as well as those behind-the-scenes, the film shows Chicago as no one has ever seen them before.